Nintendo announced a whole lot of cool news at its streaming-only press conference last night, but one image really seemed to pop. Poor Urbosa, the badass Gerudo warrior whose spirit currently inhabits a twenty-story tall camel (it’s a game thing) has been wrecked. The above are four toy figurines from Nintendo’s amiibo line, based on characters from the excellent Zelda: Breath of the Wild. They use NFC to communicate with games and give owners cool in-game stuff. They’re also catnip for toy collectors. The fish lady, Mipha, is demure in the game, and also at the sight of Urbosa’s weird mashup of Seven Year Itch and Hollow Man. Which is nuts, because I’m pretty sure that character is the healer in the game and has probably seen some things. Revali, the bird man is very brave. In the game he flies headlong into battle. 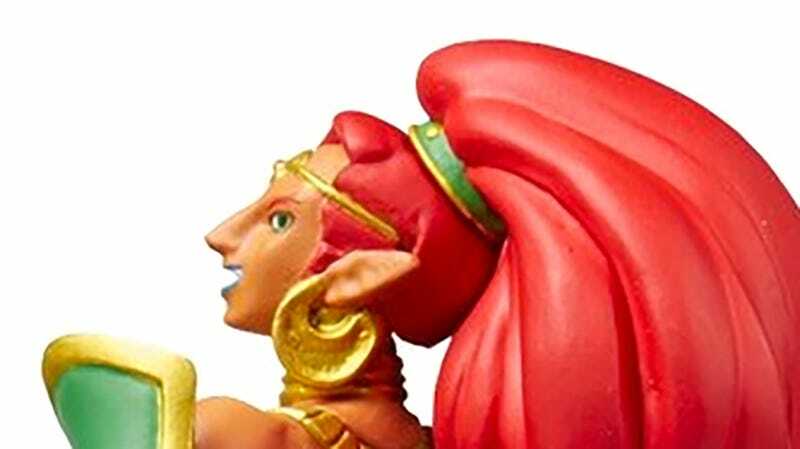 In Amiibo-land he stares brazenly at Urbosa’s best day ever. The big roly poly man, Daruk, is honestly just out to have a good time. And so is Urbosa. Look at that face. That’s a face of a woman getting ploughed by translucent forces and loving it. We should all want to be as brazen and carefree as our girl Urbosa.